1. Remember To and For. We need to ask to help and we need to ask for help during this season. All the work cannot be on one person. 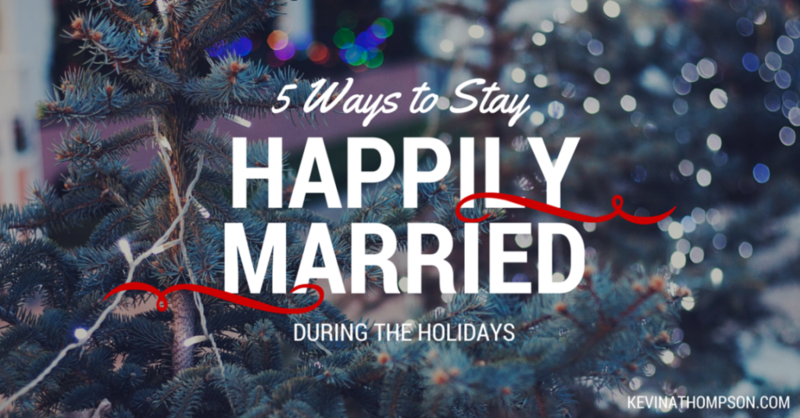 While there are exceptions, in most families the holidays are a stressful time for wives as they are expected to do everything and a relaxing time for husbands as they do nothing. This can quickly hurt a marriage. Whichever spouse does a majority of the work has to be willing to ask (and actually receive) help. If you need help, ask for help. In the same way, whoever traditionally does less of the work needs to continually offer to help. Make it abundantly clear you are willing to assist in whatever way possible. Find ways to help. Be willing to take directions. Do whatever it takes to make your spouse feel as though they have a working partner to assist with the holidays. 2. Love Them, Don’t Be Led by Them. Family is great. We should do everything in our power to accommodate as many family requests as possible, however, we are in charge of our schedules and there is only so much we can do. Do your best and move on. In far too many families, the person who whines the most gets their way. Don’t give control of your holidays (or life) to the person who plays the victim role the best. Do what you can, be where you can be, and apologize for what you can’t do. If someone doesn’t like your choices, remember to tell them we are happy with our decision, thank you. 3. Reject Guilt. The holidays are often full of false guilt. Because we are not able to meet everyone’s expectations and keep everyone happy, we are prone to feel guilt. Many families are run (and ruined) by guilt. Passive aggressiveness, shame, and guilt are commonly used tools by many grandmothers, mothers or families. Be kind, be gracious, but reject the guilt which others attempt to put on you. 4. Help Somebody. Few things deepen a bond between two people like serving a common cause. One of the best ways to experience and express gratitude is to help someone else. Buy someone dinner, call someone who might be lonely, invite people over who might not have a place to go, do something to assist another. By turning our attention to service we will prevent the holiday from being all about ourselves. 5. Plan Fun. The holidays are an opportunity to break from the normal routine and have fun. Don’t hope that it happens, make it happen. Schedule a game night with the kids, plan a less elaborate meal if it would free up time to visit, do whatever it takes to place fun at the top of the priority list. And at some point, make sure you have one on one time with your spouse. Communicate your love for one another, your appreciation to journey life together, and just enjoy the presence of each other. This entry was posted in Site News & Updates and tagged family, guilt, happy marriage, holidays, stress. Bookmark the permalink.